Between the wars, that is between World War I and World War II, and between Harry Vardon and Nick Faldo the inarguably best British golfer was a handsome, well-dressed gentleman fond of the good things in life, Henry Cotton. This 1980 inductee to the World Golf Hall of Fame won 31 tournaments in Great Britain and Europe even though there was no organized tour comparable to today’s European Tour. His major record includes three victories in the British Open (or just plain Open if you hail from the eastern shores of the Atlantic). In a day when travel was much more difficult, he rarely chose to compete in the U.S. playing only a few times in the U.S. majors—three Masters and two U.S. Opens, never in the PGA Championship. Born in 1907 he started playing at the age of 12, turned professional in 1924 and began winning right away. His string of Opens began in 1934 followed by the 1937 Championship and finally after the War in 1948. During the 1930s his fame grew and he was a standout on English Ryder Cup teams including being captain in 1939 the year the matches were cancelled due to the start of WW II. 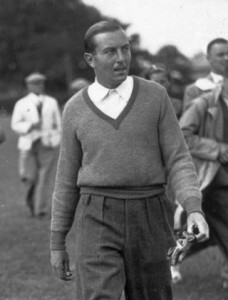 Cotton had his best competitive year in 1937and felt that his Open win that year was as he put it, “my crowning achievement.” He set a scoring record for the Championship at the time with a 65 in the third round which gave him a 54-hole lead of 11 strokes. The 65 so impressed the people at Dunlop Golf, Great Britain’s premier equipment maker back then, they introduced a new golf ball named the ’65’ which sold well for 40 years. Cotton gave up competition in 1952. He authored ten books, designed several golf courses, travelled extensively and did some instructing with his most famous swing tip being, to hit irons properly practice hitting a tire lying flat the ground.